Hostel Weber is displayed in the charming historic building In the heart of the picturesque city of Cesky Krumlov. Visit the reconstructed guest house with your family and the friendly atmosphere where you can always spend a quiet and comfortable time. 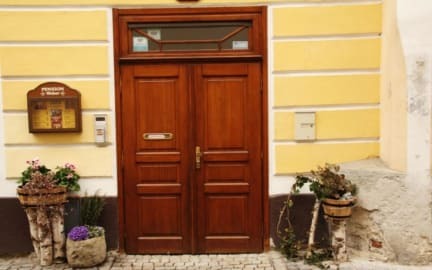 The Weber Guest House is located in the very historic heart of the picturesque city of Cesky Krumlov (UNESCO monument), only five minutes walking distance from the main square. Apart from the main feature of the city of Cesky Krumlov – the castle, Baroque theatre, Egon Schiele Art Centre, the revolving auditorium and other sites, we arrange the renting of boats, kayaks and canoes, bicycles and cycling gear for our guests. We will be happy offer you further tips for excursions and events in the surrounding areas on site. The very elegantly rooms furnished at an international standard always have a bathroom with a shower, WC, TV and satellite. Children’s cot free of charge. Animal pets free of charge. 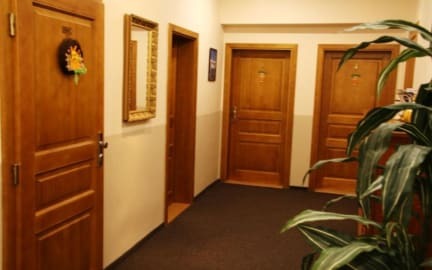 We have a garage with a lock (free of charge) and upon agreement a parking space (free of charge) in front of the guest house can be made available for bikers and cyclists. Also available a fully furnished small kitchen. The guest house also has a cosmetics salon, hairdresser pedicurist, manicurist, turbo-solarium. Medical services are also available – dental and gynecology surgery. In the whole guest house is a free Wi-Fi Internet access. One child under 3 years is charged EUR 4 per night in a crib.